Did you know that a group of rabbits is called a colony? And the collective noun for bunnies is a fluffle! 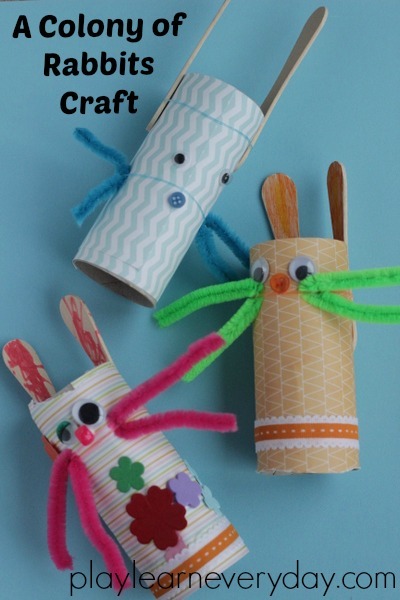 So with Easter fast approaching we decided to make our own little colony of rabbits using cardboard tubes and lots of pastel coloured paper, perfect for welcoming spring. Lately Ethan has been loving turning our cardboard tubes into fantastic creations, whenever he spots an empty one he quickly grabs it so that he can make something out of it. So it seemed the perfect choice for our rabbits today. We started by cutting our lovely patterned pastel paper so that it was the same height as the rolls. Next we covered the paper with glue and wrapped it around the cardboard tubes. Then we used our favourite method of helping things to stick while the glue dries, and wrapped elastic bands around the tube. While the glue dried we coloured in the lolly sticks using markers, as these will be our bunnies ears. Ivy coloured hers all in one colour while Ethan decided to draw little pictures on his ears. Because the lolly sticks were quite heavy (and we were too impatient to wait for more glue to dry!) we used loom bands to keep them on our rabbits. These are perfect as we've got quite the collection that need using up and they come in lovely bright colours. Then the loom bands became a perfect way to attach our whiskers as well! We cut pipe cleaners long enough to be two whiskers and folded them in half, then tucked them into the loom band, one on each side. Next we decorated our rabbits with googly eyes, button noses, ribbons and paper cut outs. Our colony of rabbits is so cute, and really fun to play with. Ethan has already made them some little carrots to eat! I think we're going to have a lot of fun with them. This post is part of a fun blog hop of collective nouns! A group of bloggers (what do you call a group of bloggers?) has got together to share some fun ideas. Check out this Pod of Whales Craft from Let Them Be Small and tomorrow you'll get to peek at a Pride of Lions over on Kids Craft Room. These little bunnies are adorable!